O.M.G. You might have just saved my sanity with this post. We are unable to get my piggy house trained. He pees CONSTANTLY! We have been giving him a big bowl of water with his food…and available through out the day. Good luck with the trial! Potty issues are so frustrating, but not giving Oscar a lot of water with his pellets helped us a ton. We give him a small bowl of water with his pellets now, and I know a lot of pig parents wet the pellets down like you mentioned. Hope your trial goes well! Our piglet is unfortunately not neutered yet, so he is going potty in the same spot like a dog would who is marking his territory. It’s just his spot. One in front of my sons bedroom door & one in front of our bedroom door. My fiancé is starting to lose his mind over it. I’m hoping once we get him neutered this week, it will stop. We have tried EVERYTHING to stop him from going in those spots. Like every possible floor odor cleaner you can think of. Did you experience this with Oscar? Hi Hailey and Stephanie! This is a tough one, and I appreciate you replying to help out, Stephanie! I love when others respond to help because I certainly don’t always have the answer and sometimes it’s just a matter of trying several different things that have worked for others. The potty training does get easier as they get older and bigger since they can simply hold it longer. One thing you might check is how much water your pig is drinking at meals. I know it’s never popular to tell you to withhold water from a pig, but one issue we had was that Oscar was drinking a ton of water with his meals and causing him to have accidents. We would give him a big bowl of water with his meals, and he went back and forth between the bowls, resulting in him taking in a lot of water all at once. Then, after his meal, he would pee several times within the next hour and he was having significantly more accidents than at any other time of day. He just couldn’t hold it. Since it’s important for pigs to have access to water at all times and especially at meals, we wet down his pellets for his meal and then gave him his bowl of water immediately after he finished eating (we still do this…). This keeps his pellets wet to avoid any blockages but keeps him from doing the back and forth between bowls which is when he took in too much water at once. For some reason, having his water right after his meal instead of during helps keep him from taking in too much all at once. So, something to consider if you notice the accidents are happening more after meals. Other than that, when Oscar was young, I took him outside about every hour or two just to give him the chance to go. Even now that he’s over a year old, I still take him out every three hours. He just pees a lot, and he will go in the house if I don’t get him out in time. So, I’m sure you’ve thought of this and have checked it off of your list, but I just wanted to mention it in case your pig is just not able to hold it fully yet. Your post about Oscar’s accidents from drinking all his water with meals secured our Bacon-Bit’s ability to stay with us!! He started doing the same as Oscar and cleaning rugs every day wasn’t working for me. Followed your solution and not one accident since. At 4 months old he only needs to go out 2 to 3 times a day. He is so good in so many ways and we are really starting to enjoy him now. Thank you so much for the time you spent chronicling Oscar’s development- still a learning tool for we new pig parents. Can you please explain exactly what you did to help your pig not have accidents as much? Mine is 4 months old and I’m not going to be able to keep her if she keeps this up. Do you take him outside or use a litter box? My Piggie was doing real good with the box but now she pees EVERYWHERE. I went back to keeping her in the bathroom so she can re learn the box and she still pees on the floor. Peeing while drinking has been the worst nightmare too. I am going to try the pellets and water at meal time and upgrade to a super large box praying this helps. I can’t keep carpet scrubbing my carpets every single day. I love Piggie so much but with a 3 year old daughter I can’t have pig pee everywhere! In my experience, Oscar was quick and easy to potty train, but it took him a long time before he had it perfected. During that in-between time, we had some accidents. Usually, he wasn’t able to communicate to us that he needed to go outside and he just couldn’t hold it any longer. If you haven’t already, you might try potty bells for Renly. They didn’t work for us at first, but these days we keep them out and Oscar will “ring” them when he really needs to go, so overall I’m glad we have them. For what it’s worth, at about one year old, we hit a point where I didn’t stress at all about potty training, so hopefully you are almost there. Although, I’ve had those moments of panic and distress when he is just standing and then pees out of nowhere, so I feel your pain! Hi Markel! I completely agree with Stephanie on the smell. Male pigs who aren’t neutered have a strong and unpleasant odor, so that’s likely what you’re smelling. Once they have been neutered, that smell starts to go away. Oscar had a bit of that smell when he first came home as the hormones were wearing off after his neuter, and now I never smell it. Hope that helps! My guess then is that it’s just the hormones wearing off, and it does take some time for that smell to completely go away. In fact, a few weeks after we brought Oscar home, I took him to the vet to make sure he had been neutered by the breeder because the smell was still there. Our vet confirmed that he had been neutered and said to just wash his belly with a warm, damp washcloth when the smell bothered us until the hormones wore off. Male pigs are prone to UTIs so that’s another thought, but my guess here is that the hormones just haven’t completely worn off after the neuter. Can you tell me what the “normal” amount of water is for a mini pig per day? Pinto is 4 months old and I swear I’ve never seen an animal consume so much water! I feed him the Mazuri food and he gets a few treats each day, but nothing that has much sodium in it. I’ve heard they should have free access to water at all times but he will Never be potty trained if he drinks this much! In a matter of days I had my pig box trained. I cleaned up his messes w paper towel and shredded the soiled paper towel and put some of it in his box to act as a reminder to urinate in the box. As he grew, I increased the size of his box. This worked very well and he was using the box independently, up until 2 days ago. For some reason, he decided to both poop and pee outside of his box when he feels like it (he still uses the box from time to time) and it seems more often than not. My question is, what could have caused him to regress? I turned a large kennel half into a litter box because I thought maybe his box was getting too small. I’ve used a scrub brush and vinegar to clean the area I have cordoned off for him. I’ve even went so far as to going back to using shredded bits of paper towel as a reminder, but he still continues to be stubborn? I’ve contacted the breeder seeking advice and she also told me she’s heard of this happening and she doesn’t even know why. Her advice thus far has been very credible so I trust she’s telling the truth. Do you or anyone else on here have any suggestions? I’ve literally went through 5 rolls of paper towel and 1/4 gallon of vinegar cleaning up the “accidents”, but I’m just at a loss. My guy’s troubles began right when he needed to get neutered AND he got a UTI right after AND super cold and wet weather kicked in. Apparently they don’t like going out in the freezing snow to do business. Although I will say that he has never Pooed inside. Ever. But pee is a different story. I have not been able to get it right after the UTI cleared up. He knows where he is supposed to go since he goes and pees in his boxes to get a treat sometimes. I make big fuss whenever he does right. He figured everything out about what gets him treats in a nanosecond but this one here doesn’t seem to matter. Sometimes I am sure he does it as an attention getting device, like when he knocks over stuff to make me look. I figured out that in his mind, he thinks that once he gets my attention, even if I’m upset, I’ll get over it and give him a treat. So I am super mindful that when he does something bad, he experiences a very unpleasant consequence only. I do not mean beat him. I mean, he gets absolutely no benefit and a very distinct sense of punishment so that there’s no confusion about “bad attention is better than no attention.” it is NOT. So there’s my saga now. I am glad your breeder is good. I don’t believe anything mine says anymore. Be well. Also, this blog rocks! Keep it up. I love hearing about Oscar. I also know that feeling about pigs vs. dogs. My dog will do anything for me simply because she wants me to be happy. This guy will do anything he wants so he can be happy. That’s the difference between pigs and dogs. Its a HUGE one and I don’t hear anyone talking about it- having a pig requires a signficant change in expectations. Our little guy is also named Bacon-Bit and is now 4 months old. I hope you went for outside training because it is very effective. We put up bells as soon as we got him, but he is only now using them inconsistently with making a fuss at the door when he needs to go. We had same issue as Oscar’s mom with accidents when he suddenly started gulping all his water with his food. We started wetting his pellets and only giving a half bowl of water, which he rarely touches til supper, drinking all with supper. He is wonderfully healthy and only goes out 2 to 3 times a day. Never wakes us up during night and sleeps the night in closed crate. We figured out our boy picks up well if supported under his chest on the way up and arm across him lengthwise once he is up. We do have our tough moments, but overall we seem to have lucked out in these two areas. Pick your timing. If he is on a rooting mission through the house or anticipating mealtime, etc. let him be til more receptive time. Say hi to fellow “Bit”. So my piggy pua is litter trained but we’re are outside often so he prefers to go outside. During the day when I am at work he is in his kennel for now. But I know he will soon outgrow this. How do I train him to just go outside and totally get rid of the litter box? Also, what about when he is in his kennel or eventually in a confined area while I’m gone? Do I continue to use both outside and the litter box? What does everyone do while they’re out? HELP!!! I brought my little piggy peppa home about 4 days ago. She is 3 weeks old and is taking to me as pretty well for only being with me for 4 days. I’ve already trained her to bottle feed and walk outside in a harness, she took to those pretty quickly. The only thing I’m having trouble with is potty training. I’m trying to teach her to go indoors as well as out doors. I set up a pee pad with her water bowl next to it (I was told that helps) and even bought some spray that is scented to make her want to pee on, it is meant for training puppies but I assumed it was worth a try. She still won’t go on it! The only place she will go just happens to go is my bed… I even tried leaving her in the room with the pee pad for a while to go pee but she actually held it until she got on my bed then instantly went. If you have any tips that would be awesome! Thanks! 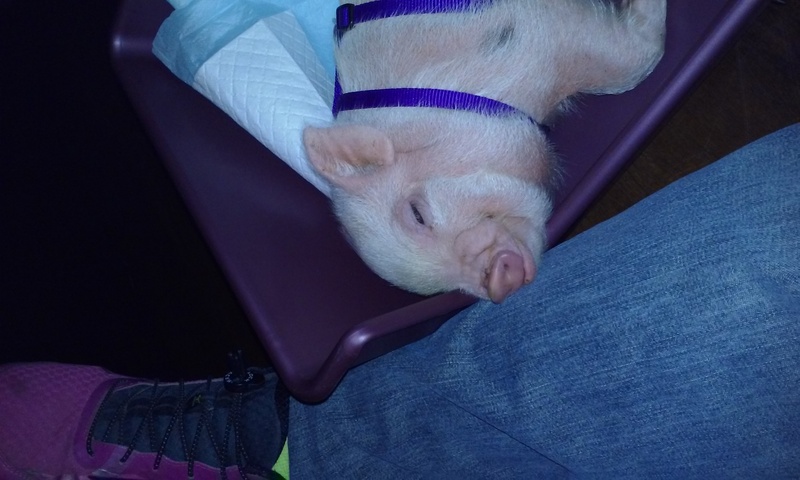 Hello, my mini pig is about 5 months now and he is doing relatively well with potty training. We have him trained to go outside as well as use his fake grass pad indoors. The issue I am having is that he will only ever pee on the mat indoors, and he will hold his poop until we take him outside. I live in Canada and the temperature is starting to drop and I know he will not like to go outside when that happens. Does anyone have any tips on getting him to do #2 inside? He does tend to like to do it under the trees when I bring him out but I had no success with a plastic litter box so I don’t want to switch back to a covered one as the grass pad has been really successful. Any advice would be appreciated!